Install or reinforce your AML system in a matter of hours, on premise or cloud, and instantly adapt to new regulations. 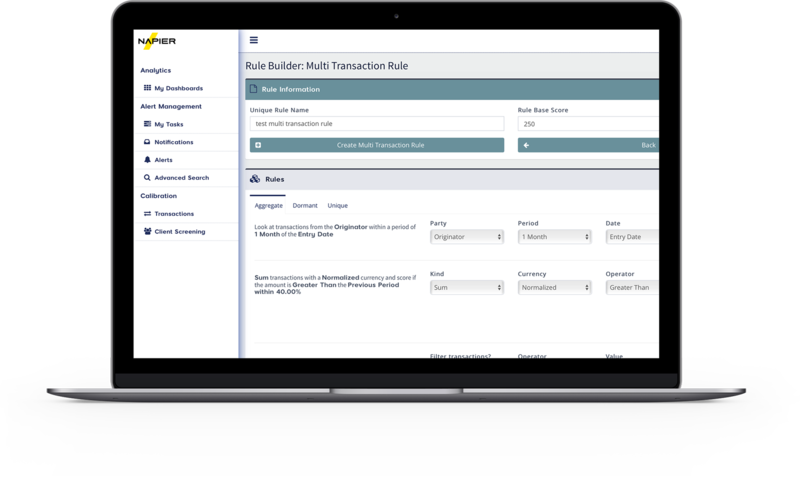 Define and test new rules and regulatory scenarios through a graphical UI built for non-technical business users. Rapidly plug holes in your existing AML processes, identify previously unknown threats and strengthen your controls. Use a dedicated test area to reduce false positives by up to 97% and uncover hidden money laundering patterns. An AML platform adaptable to every company’s needs, from global to boutique financial services firms. Define risk-based scenarios through a graphical UI. No need to code complex queries or algorithms. Ingest and process billions of data points from multiple sources and identify suspicious transactions and behaviours in real-time. Allocate investigations to team members, and manage the process from identification through to action and outcome.